The Shamrock building was purchased by Hayman Properties in December of 2014 as a compliment to the redevelopment opportunity offered with Hayman Advisors Thelma Todd Building (PCH) property. At 100% occupancy, a AAA credit tenant and an A+ location, Hayman Properties valued the stable, strong cash-flows. 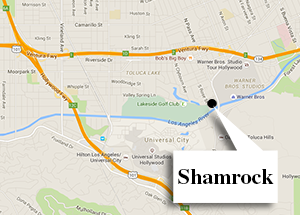 Shamrock is just beyond the gates of both Warner Brothers Studio, Lakeside Country Club and a stone’s throw from Universal Studios. Shamrock will continue as the prestigious home to some of the storied and successful film companies in the world.